One of Stage III's main objectives is to keep the performance of their cables unaffected by distortions, particularly those generated by the cable itself. Practically all the materials used to cover an electrical conductor's surface can cause distortion of an audio signal. An un-insulated or "floating" electrical conductor always performs best. All Stage III Concepts cables employ our exclusive AeroStrand™ conductor technology, maintaining the pure silver wire in contact with little else but air. Less than 3% of an AeroStrand™ wire's surface is in contact with the insulated tube. Corrosion is never a concern since AeroStrand™ conductors are completely sealed and are never in contact with external air or moisture. The spiral windings of AeroStrand™ conductors also makes them very flexible, so cables are easy to install. Every single wire in all Stage III cables is individually hand polished and treated with a molecular-bond nano-fluid that prevents oxidation and enhances conductivity at the termination points. In most respects our unique conductors have an enormous advantage over conventional wire, however in Stage III A.S.P. Reference line, a further improvement in performance is made possible by removing most of the air in the AeroStrand™ tubes; the level and an almost perfect dielectric is achieved, minimizing distortion to an unprecedented level. 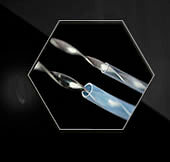 AeroStrand™ conductors are individually insulated with their own minimized-wall PTFE, PET or FEP Teflon® air-tubes, further diminishing any possibility of capacitive effects or strand interaction, resulting in one of the most precise and efficient audio signal conductors available anywhere. Click to go directly to Stage III products.